Did Scientists Find An Alien Chair On Mars? In a new image gathered by the Curiosity Rover, a research buggy currently trundling across the Gale Crater on Mars, there appears to be a very unusual rock outcropping that one conspiracy theorist is insisting might be some kind of alien love seat. 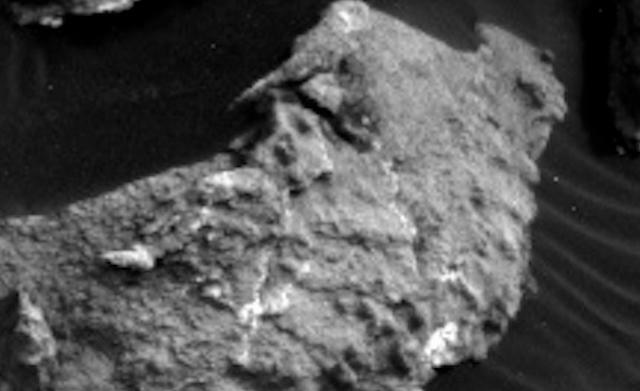 The image shows some weird rock formations on a Martian hillside, including one rock that looks like it's U-shaped. A British conspiracy theorist thinks that the rock may be evidence that Mars was once populated by an alien race, and that the rock is a chair. By his own admission, the rock's shape could have other, non-alien explanations. "It may just be something that is shaped like a chair but it does not look like a natural eroded rock and there is another interesting structure just to the right of it that also looks unnatural," says ArtAlienTV. "The chair-shaped object is quite small. Perhaps eight inches wide or less. So if it a chair is is child-size in scale." "It may well just be a ventifact caused by wind erosion but it is very symmetrical in appearance and looks manufactured." "An open mind is required when viewing images from other planets. One day our very survival may depend on it." If the aliens in question are so small they sit on eight-inch chairs, I wonder just how threatened our survival is. The "alien chair" theory comes only a week after UFO people claimed they spotted the remains of a woman wearing a dress in another Mars photo. The pic was described as "the find of the century" by a UFO fanatic. The photo was popularized by a UFO researcher named Scott C. Waring, who uploaded the pic to UFO Sightings Daily with the note "This is one of the few carvings I have found on Mars that depict a human-like species." "I have found hundreds, but never looking human, and her dress is raised up in the front, and longer in the back, much like the ladies used to wear back in the 1700s here on Earth." So maybe Mars is a place that was once populated by fancy Victorian ladies who sat in tiny rock chairs. Or perhaps people are reading too much into photos. And shouldn't leap to the conclusion that every weird-shaped piece of rock on Mars isn't evidence of an ancient alien civilization. Until we find an actual couch, it's pretty safe to assume they're just rocks.